Top professional Jayanthi Dharmasena has become the first female director on the Board of diversified blue chip Hayleys Plc in its 140-year history. Jayanthi, who serves as the Managing Director of Hayleys Agriculture and its subsidiaries and as a Group Management Committee member, was appointed to the Board last week as an Executive Director. Hayleys Plc is controlled by business leader Dhammika Perera. Jayanthi has been a part of the Hayleys Group for 26 years and is a Fellow of the Chartered Institute of Management Accountants (UK). Her appointment follows the retirement of Rizvi Zaheed on 31 March 2018. Zaheed joined Hayleys in 1981 and served the Board since August 2004. 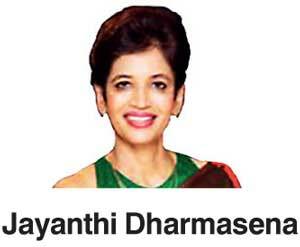 She is an alumnus of Visakha Vidyalaya, Colombo and a mother of two grownup sons. Jayanthi is also the granddaughter of the late Dr. C.W.W. Kannangara, the father of free education in Sri Lanka.